Thank you to our amazing customers for their support of our Connecticut Coalition to End Homelessness (CCEH) fundraiser during the month of December! 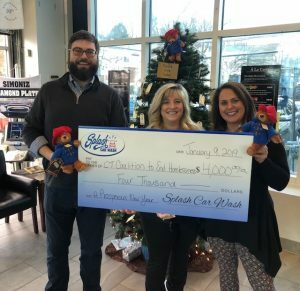 Giving trees were set up in a number of our locations providing the opportunity to purchase $25 gift tags for a Paddington© plush bear, book or blankie to be donated to children at local shelters. Through the generosity of our customers, we were able to raise $4,000 to provide 150 gifts to children in shelters and also helped prevent four families facing homelessness stay in their homes and avoid entering the shelter system this holiday season. A number of our locations throughout Fairfield County were able to participate in this fundraising initiative and we look forward to other opportunities in the future. Previous Previous post: Splash recognized to be Best of Gold Coast CT!